Sankofa Says is a place-based game that brings people together on the streets of a local neighborhood. To succeed, players join flash rallies at local landmarks, make phone calls to answer riddles about local history, and tell truth from neighborhood fiction. Our launch focused on Culver City, CA. 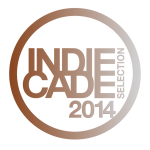 We were an “official selection” at IndieCade, a leading independent games festival, in the big games category! Every adventure requires hitting the streets, meeting new people. Even locals will encounter a few surprises. With a little luck, you will discover strange cinema history, play with public art, and even help tell the story of Culver City yourself. Our goal is for players to have fun and meet people while interacting with authentic neighborhood stories — since cities are made of stories, as well as streets and landmarks. Our design approach is deliberately low-tech, using content from city officials, neighborhood organizations and historians. 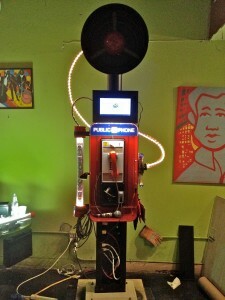 At the inspirational center of our game is a redesigned payphone called “Sankofa Red,” built over 1.5 years as a community project in Leimert Park. We hope to inspire other neighborhoods to create their own version of the game using Sankofa Red or their own redesigned payphone. >> Check out our favorite pictures from our IndieCade launch! 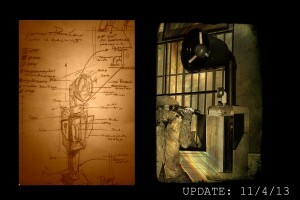 No fancy apps required: this game uses SMS, paper maps and a secret voice message system to coordinate all gameplay. Points are awarded for successful group challenges, documented with cellphone photography. More points are awarded if there are more people, and for answering questions right when you’re there. See our points page for results from the launch. Sankofa Says is a production of the Leimert Phone Company (@LeimertPhoneCo), a transmedia design collaboratory. We are based in the Los Angeles neighborhood of Leimert Park, and at the University of Southern California. Read more about the game. Follow the game on Twitter @SankofaSays. ** Phone pictures courtesy of Wesley Groves and Rudy Rude.